Toxic at moderate doses, but therapeutic at proper doses. 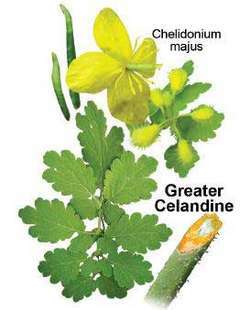 In poppy family, not related to Lesser Celandine. Yellow 4-petal flowers, wavyedged lobed leaves, yellow-orange sap. Thin, stick-like seed capsules. Immune stimulator, smooth muscle relaxer (too much can immobilize) Raises blood pressure. Sap used on warts, moles. Dry plant first before using herbally. Chemical compounds similar to bloodroot, so it’s advisable not to mess with this plant unless you know what you are doing. So far, nothing in North America has halted their advance, and while eradication is no longer feasible, the researchers hope to find a biocontrol to reduce swallowwort populations. One of the fungi being evaluated was found by a park naturalist in rural Monroe County, New York, who noticed an unusual dying off of a pale swallowwort population. After growing for 2 weeks in a quarantined greenhouse, all three swallowwort species developed symptomatic dark-red and purple spots on their leaves.